This latest investment will see the production window literally double in size since it will allow the laser machines to run for longer durations during the night. 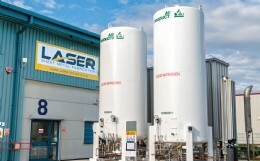 This latest leap forward is all part of the bigger picture at Laser Limited HQ and with other investments on the horizon there are some exiting times ahead for the business. As part of the QK Group operating in conjunction with Quickits Limited the company designs and manufactures products such as mounting brackets, locking devices, valve levers, sun shades, accessory panels and valve tags along with numerous other valve industry related products.